Let’s say you’re in the HR department at a promising new startup. One day, one of your most talented developers abruptly quits, giving no notice and taking no steps to ease the transition of her responsibilities to another worker. No one wants to be put in a situation like this one, but what will it take to keep this unexpected snafu from transforming into a full blown crisis? In this case, the difference between a temporary slowdown and a catastrophe will come down to the strength of your talent pool. If your organization is in the habit of putting out job ads and going through the recruitment process only when there is a position that actively needs filling, each individual hire could take you more than a month to acquire. By then, you would have likely lost hundreds of hours of productivity due to the unfilled seat on your team. If, on the other hand, your business has been generating new leads and attracting candidates even when there were no open positions, it’s likely that you’ll be able to transform one of those leads into a new hire in much more quickly than the typical recruiting cycle. This all begs the question: how do recruitment marketers generate leads and build a strong talent pipeline? One of the most important takeaways from the above hypothetical should be this: always be marketing. Whether you have a position to fill or not, constantly attracting potential applicants to the top of your recruitment funnel means that when positions open up there will already be applicants out there who are informed about your company and excited about your mission and values. With a robust employer branding effort in continuous operation, effective recruitment marketers can translate impressions on social media and other platforms into leads by encouraging newsletter sign-ups and extracting email addresses from potential candidates. To do so, it’s first necessary to create employee personas that reflect the traits and demographics of your ideal hire for each role at your company. Based on those demographics, you can carefully choose which channels will be ideal for your messaging. Remember, only 20% of people are job seeking at any given time. So, in order to reach the other 80% of potential candidates (most of whom would happily change jobs if the right offer came around) it’s crucial to go where they are. This means avoiding (or at least not exclusively relying on) traditional recruitment platforms and instead reaching people on channels like Facebook and Reddit—places where inactive job seekers are just as likely to spend their time as anyone else. 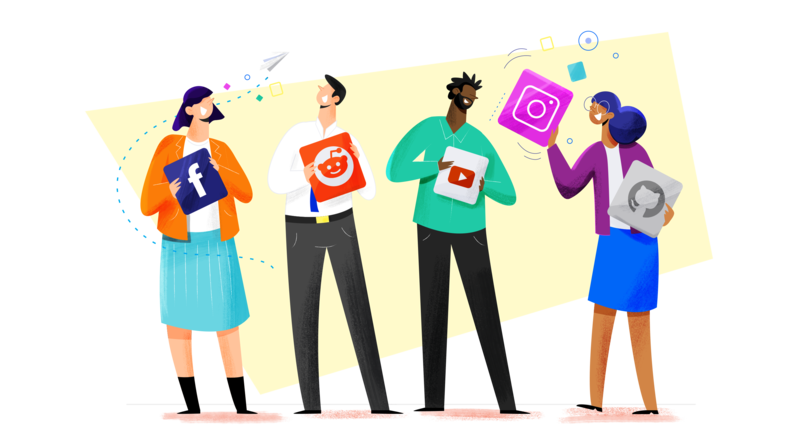 While, from an organizational perspective, putting out a constant stream of ads and posts might seem daunting, there are numerous marketing automation tools that streamline the work of promoting your brand and tracking your leads. We’ve already gestured at employer brand a few times in the first half of this article, but when it comes to lead generation it’s a concept worth digging into. Let’s say you have successfully integrated a recruitment marketing automation process into your existing ATS, and you’re successfully promoting your company across a number of channels. What happens next will largely be determined by the strength of your employer brand. After all, your messaging, visual assets, and other brand elements have to be eye-catching and engaging enough to eventually entice job seekers into your recruitment funnel. Of course, most people are not going to submit a job application the first time they encounter your employer brand (which is precisely why it’s so important to make sure people read and hear about your company early and often). But the fact remains that your ability to generate leads with your various marketing campaigns will depend on how successful you are at setting yourself apart from the competition. This is another point at which it is crucial to consider your employee personas. Ask yourself, “what unique value can my company provide that would entice our ideal candidate to submit an application or provide his or her information?” If you’re trying to attract younger talent into your pipeline, you might make flexible hours or further education opportunities the centerpiece of your messaging. For ads targeted at more senior applicants, you might emphasize career stability or high levels of responsibility. This messaging should be present in ads and social media posts, but it can also be incorporated into other content, from informative blog posts and open source projects to presentations given at industry conferences, in order to attract even more potential leads. In each of these instances, it’s important to ensure that you’re giving potential applicants the chance to engage with your company, possibly by opting into e-mail newsletters or downloading a free piece of content. This way, you can keep in touch with your potential applicants and nurture them with additional targeted content. We mentioned recruitment marketing automation briefly above, and perhaps the most important facet of this kind of automation is that it makes most recruitment marketing actions easily repeatable. But how do you know which actions are worth repeating? This is where tracking the effectiveness of your lead generation attempts becomes such an important part of the process. You should always have a strong sense of which pieces of content are attracting the most people to the top of your applicant funnel, and how each of your targeted demographics are responding to your messaging. Track the number of impressions for each ad or post, the click rate (or the click-through rate if appropriate), and the conversion rate for every other step in the process. As you nurture those leads, you should be utilizing the same approach—closely tracking what works and what doesn’t, and doing more of the former and less of the latter.